Jabil Circuit, Inc. (NYSE:JBL) hit a new 52-week high earlier this week after getting upgraded to an “Outperform” rating by Raymond James. This follows last month’s upgrade to “Buy” from Cross Research, who also raised their price target to $30 (a +22% upside from current prices). Our research indicates further long-term upside for JBL, even after its excellent price run the last few months. Our thesis mirrors our past bullish report on Flextronics published on January 24th (Flextronics is up +13.7% since). Jabil Circuit combines an attractive valuation with strong price momentum, excellent business quality and a track record of beating analyst expectations. Each of these factors, on their own, has been historically proven to predict future outperformance; Jabil combines them all in a single stock. Jabil Circuit, Inc. is a U.S.-based global manufacturing services company. It divides its services into three areas: design engineering, supply chain and logistics, and fulfillment and distribution. It is the third largest contract manufacturer in the world, servicing clients in the technology, automotive and other industrial sectors. Jabil has been a beneficiary of the trend toward manufacturing outsourcing, a trend that’s proven attractive because of its advantages over traditional internal manufacturing, including: increased expertise, economies of scale, and capital savings. Perhaps the poster-child of outsourced manufacturing is Jabil’s biggest customer: Apple Inc. (NASDAQ:AAPL). Jabil manufactures the phone casings for Apple’s iPhones – a service that accounts for 18% of JBL’s total revenue. While contract manufacturers often trade cheaply on a sales basis – Jabil takes this to an extreme. With trailing twelve-month revenue of $16.7 billion and a market cap of $4.74 billion, Jabil currently possesses a sales yield of 352%. This is relative to an average sales yield of 67% for its electrical equipment industry group and an overall market average of 52%. These are not empty sales either as Jabil netted $287 million in profit over the last twelve months. This results in a 6.06% earnings yield, which is again higher than the industry group (4.26%) and overall market (3.80%) averages. Like its competitor Flextronics, Jabil is a strong free cash flow generator (free cash flow yield of 32.55%). Jabil also sports a solid price-to-book multiple of 2.1x, which puts it in the top half of the market. The company pays a mediocre dividend yield of 1.31%, preferring to reward shareholders with tax-efficient share buybacks. On average, cheap stocks have historically earned a premium over expensive stocks. By comparing each of the metrics above to the historical excess returns generated by companies with similar valuation profiles, our model expects 7.72% of annualized “value alpha” from Jabil. This means that, holding everything else equal, we expect Jabil to outperform the returns of the S&P 500 by 7.72% over the next 12 months due to the company’s cheap valuation. Jabil has been a strong performer gaining 20.3% over the last six months and 37.7% over the last 12. These gains put Jabil in the top 30% and top 20% of performers over the respective time periods. Both represent more than triple the industry group average, which shows that the company has been a real industry leader. The market has begun to wake up to the opportunity within the stock. Unlike other high-momentum stocks, Jabil’s underlying business also has been generating strong results for shareholders. Over the last twelve months, net income has grown 12.3% while returning a solid 12.5% on equity and 3.37% on assets. All three of these numbers are above the market average and show the increasing strength of the business. On average, stocks with strong price momentum historically outperform stocks with weak momentum. Taking each of the metrics above into account as well as the historical excess returns generated by companies with similar growth profiles, our model expects 3.57% of annualized “growth alpha” from Jabil. This means that, holding everything else equal, we expect Jabil to outperform the returns of the S&P 500 by 3.57% over the next twelve months due to the company’s strong growth profile. We also consider the quality of the company’s earnings and business. In a world that is overly fixated on the short-term bottom line, investors tend to put a greater emphasis on earnings quantity rather than earnings quality. This leads to artificially high prices for companies that have high quantity/low quality earnings, and vice versa. The two most important numbers to focus on in the table above are earnings accruals and external financing. We calculate earnings accruals using the cash flow method: (TTM Net Income – (TTM Operations – TTM Net Income)). Companies with positive accruals tend to have high accounts receivables. This sets the company up for future earnings disappointments if it cannot collect what it is owed. Historically, it’s been a bad bet to buy companies that report high earnings accruals. Jabil’s earnings accruals were negative over the last four quarters, which means the company received more cash from operations than it reported in net income. These accruals made up 3.69% of Jabil’s total assets, which is way below the industry group (2.91%) and overall market averages (0.03%). This means that management is being conservative in its accounting and is reporting high quality earnings. Jabil also has been steadily reducing both debt and share count through its targeted share buyback plan. Over the last 12 months, external financing outflows have made up 10.89% of total assets. Companies with net negative external financing have historically outperformed as share buybacks are a sign of financial stability. Overall, our model rates Jabil as a “Good Quality” company and expects minor tailwinds because of it. After beating last quarter’s EPS consensus by 15%, Jabil has now beaten the EPS consensus eight quarters in a row and in nine of the last 10 quarters. Jabil beat last quarter’s revenue consensus by 5.3%, marking its third beat in a row and eighth beat in the last 10 quarters. This is an impressive track record of beating analyst expectations and makes future beats more likely. Jabil releases earnings in 23 days, with analysts expecting $0.39 EPS and $4.46 billion in sales. Based on a historical back test of companies with similar earnings track records, our model puts the probability of Jabil beating EPS estimates at 75-100% and expects a fairly large beat (5-10%). 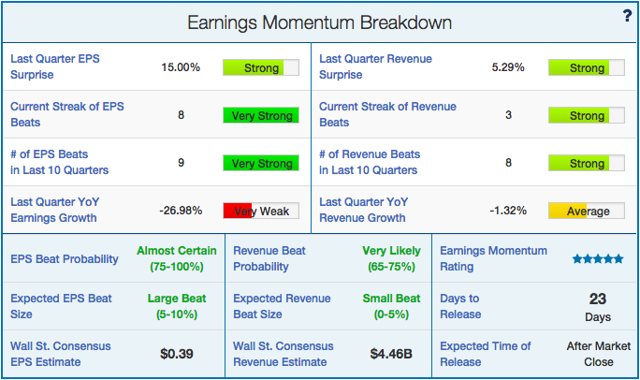 It projects a 65-75% probability of Jabil beating revenue estimates, and expects a small beat (0-5%). Overall, our model rates Jabil a perfect five stars in earnings momentum. We believe that history is the best guide that we have to the future. Based on the metrics that have historically predicted stock returns, Jabil is poised to outperform over the next 12 months. The stock is attractively valued, possesses strong price momentum, has high quality earnings and has been consistently beating analyst expectations. Jabil has all the ingredients of future success. On top of that, management is providing steady fuel to the stock price with its use of share buybacks. This is not only a dependable source of buying pressure for the stock, but also reduces share count and increases earnings per share.